Although Thailand did not enter the Universal Postal Union (UPU) until 1885, its philatelic heritage begins quite a bit earlier. (Thailand was called Siam until 1939, so all classic Thailand material will refer to "Siam" when western characters are used.) When a British consulate was opened in the Siamese capital Bangkok in 1858, the consulate staff began handling mail headed out of the country. These letters were franked with Straights Settlements stamps and forwarded to Singapore where they joined the mailstream proper. Also predating a formal mail system, King Chulalongkorn (1868-1910) developed a Royal Palace Post. The Palace Post, complete with stamps, kept the extensive Royal Family connected. Immediately prior to Siam joining the UPU, from 1882 to 1885, the post office functions at the British Consulate were made official and it was designated a "sub-post office" of Singapore. During this time Straights Settlements stamps were overprinted with a "B" to indicate Bangkok. During the same period, for internal mail, the Palace Post was supplanted by a more general system modeled on the UPU style. The government commissioned Waterlow and Sons to produce a series of stamps featuring King Chulalongkorn. The most notable feature of these "pre-UPU" issues is their lack of conformity to more Western design conventions. The country name was printed only in Siamese lettering. The Siamese currency units were distinguished only by their frame designs! When Siam joined the UPU, the first thing the Union did was require the nation to adopt a more straightforward method of expressing stamp denominations. It took two years after joining the UPU before Siam would issue its first series of conforming stamps. The 1887 stamps again featured the king and were printed under contract with England's De La Rue firm. 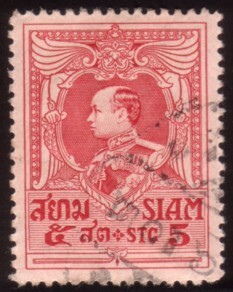 The Siamese government was dissatisfied with the quality of the early stamps because the fugitive inks were unstable. This instability proved to be a particular problem due to the humidity of Siam which caused the inks to bleed and change color. Searching for better quality, the Siamese government next contracted with Giesecke and Devrient of Leipzip who printed Siamese stamps until 1910. In 1912 Siam's new King Rama VI was honored on a series of stamps printed by the Imperial Printing Works in Vienna. However the outbreak of the first world war would soon cause Siam to break relations with Austria. Once again searching for a printer, the government turned back to England's Waterlow and Sons who would print Siam's stamps until 1939 when the country changed its name to Thailand.